Fleetwood Town boss Joey Barton wants his players to keep getting used to winning matches – even if it is only in pre-season. 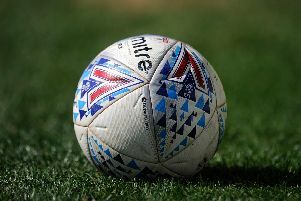 Barton’s men made it three wins from three in pre-season after beating Slovakian second tier side STK Fluminese Samarin in the first game of their Hungarian tour, following on from victories against Southport and Salford City. Fleetwood’s second and final match in Hungary takes place today at 4.30pm UK time as they face Hungarian side Zalaegerszegi TE at Telki Sports Park. Barton’s feet are, however, firmly on the ground despite scoring three times against Southport and following that with four goals against Salford and Samarin. He is determined to breed a winning culture ahead of his first league managerial game in charge against AFC Wimbledon at Highbury on August 4. Barton said: “I’m not one for getting ahead of ourselves because we have got a lot of work to do and, realistically, what we do here isn’t important if we don’t win football matches in the league. “So it is important that we keep progressing, keep getting better and I have never done friendlies in my life! It has not just been a new chapter on the pitch for Barton but off it as well after partner Georgia gave birth to their third child, Penn Anthony, on June 20. Penn is the couple’s second son with Cassius born in 2011 and daughter Pietà arriving in 2014. Penn arrived on the third day of the players’ return to training at Poolfoot Farm. While it has been a whirlwind start to his first managerial role, Barton stressed he could not be happier. He said: “It has been great because I have not had time to think. “I have literally been getting up at 6am; I’m out the door, we get into work with the lads and get through the coaches meetings, analysis and structure of the day – before I know it when I walk off the training ground and get back in the car it is about six o’clock.